Marcella C. (Missler) Scherer, 102, of Sandusky, passed away late Sunday morning, July 8, 2018, in the Stein Hospice Care Center, Sandusky, after a brief illness. Born on September 21, 1915, in Bismarck, OH the daughter of Frederick Peter and Ottilia (Gerber) Missler. Marcella had worked for over 20 years at American Crayon (later Dixon-Ticonderoga, Inc.), before retiring. She was a member of St. Mary's Catholic Church. 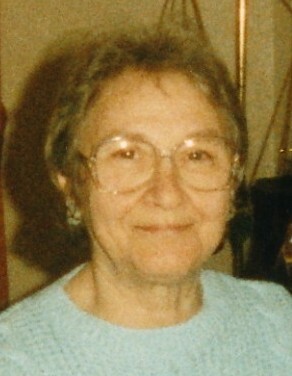 She is survived by three daughters, Carol (Paul) Bledsoe, JoAnn Keinonen and Rose Morency, all of Sandusky; and a son, Thomas (Nancy) Scherer of Sandusky; six grandchildren; seven great-grandchildren and three great-great-grandchildren; a twin sister, Rosella Heydinger of Tiffin; a brother, Herman (Virginia) Missler of Bellevue; and several nieces and nephews. Marcella was preceded in death by her parents; her husband of 64 years, William Jacob Scherer, whom she married on November 18, 1944, he passed away on December 28, 2008; her brother and sister-in-law, Elmer (Marie) Missler; her sisters and brother-in-laws, Henrietta (Leo) Frisch, Lucille (Arnold) Schneider, Joann Missler, Irene (Kenneth) Oeder, Rita (Vince) Felker, Zita (Fran) Huss, and Ralph Heydinger. Visitation will be held on Friday morning, July 13, 2018, from 9:30 am until time of the Mass of Christian Burial at 10 am at St. Mary's Catholic Church, 429 Central Avenue, Sandusky. Fr. Matt Frisbee officiating. Burial will be in Calvary Cemetery, Sandusky. In lieu of flowers, the family suggests that memorial contributions may be made in her memory to one's favorite charity. Your memories and words of comfort may be shared with Marcella's family at davidfkoch.com.